Safer food handling: Touchless dispensing helps minimize risk of cross-contamination. Complies with HACCP guidelines: Supports HACCP standard operating procedures by reducing the potential for cross-contamination and helping reduce the risk of food-borne illnesses. Lowers cost: One-at-a-time towel dispensing reduces waste and lowers operating costs. Increases operational efficiency: Adjustable settings for sheet length, time delay, sensor range and dispensing mode control usage. Easy to clean: Rubber seal locks out moisture so the dispenser does not have to be removed during wash down. Towels remain dry while dispenser can be sprayed with cold or hot water up to 140° F and 1,100 psi at a minimum of 3 ft away. Improves hygiene: Touchless dispensing minimizes cross-contamination risk and creates a more hygienic environment. Meets EPA guidelines: High capacity roll towel meets EPA standards for recycled content. Reduces waste: One-at-a-time towel dispensing reduces waste while a host of other cost-cutting benefits combine for considerable savings. Enhances image: Sleek design and matching soap, air freshener and tissue dispensers convey a high-end atmosphere. Complies with ADA regulations: enMotion® meets Americans with Disabilities Act guidelines when properly installed. 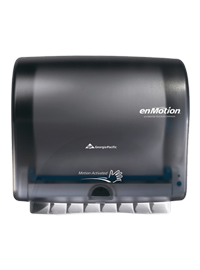 Dispenser measures: 14.8" x 17.2" x 10.8"
Promotes hygiene: The same touchless technology found in the original enMotion® dispenser improves hygiene and reduces cross-contamination. 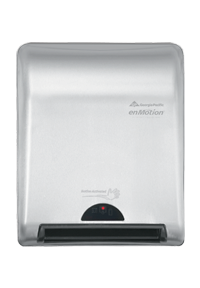 Saves space: Unit requires less vertical space but uses the same 8.25"-wide roll towel as the enMotion® recessed automated touchless dispenser. Lowers costs: One-at-a-time towel dispensing encourages users to take only the paper they need. Meets EPA guidelines: High capacity roll towel meets EPA recycled content standards. Looks good: A smaller profile, sleek design and contemporary finish complement any décor. Dispenser measures: 13.23" x 9.50" x 13.12"
Dispenser measures: 14.80" x 9.75" x 13.30"
Upgrades appearance: A built-in look and fit extending just 3" from the wall convey a premium image. Helps ensure hygiene: Hands-free technology delivers towels with minimal risk of cross-contamination. Controls costs: Adjustable, single towel dispensing reduces usage by up to 20 percent and increases operational efficiency. Enhances service: High-capacity system and paper transfer mechanism provide continuous service. Follows EPA guidelines: High capacity roll towel meets EPA recycled content standards. 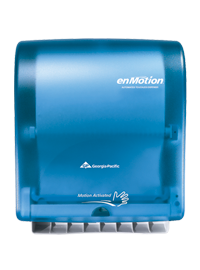 Dispenser measures: 13.30" x 8.00" x 16.40"